Dominic was unwell when he was seven weeks old – crying a lot, being sick and his temperature kept dropping. He wasn’t himself at all. We took him to A&E and the doctor thought it was meningitis. They kept him in and after a week he seemed well and they sent him home. When he was nearly four months old we were sent to a specialist children’s hospital where they did two MRI scans. They had noticed a spontaneous bleed in his brain. A week later they performed another MRI scan, this time with dye. The doctors could see a tumour, but wanted to investigate further. I was scared. I didn’t know what would happen next. 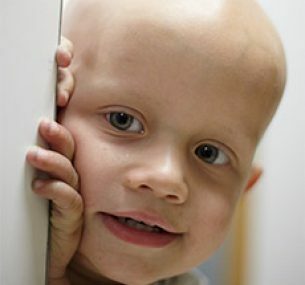 I just couldn’t believe that my son had cancer. As with any parent, I would do anything and everything to help my child. They decided on surgery, but were unable to remove it. They took a biopsy for analysis. Four days later we were told that Dominic had glioblastoma. I was scared. I didn’t know what would happen next. I just couldn’t believe that my son had cancer. As with any parent, I would do anything and everything to help my child. We were told that Dominic would need to have chemotherapy to reduce the tumour before they could try surgery again. Chemotherapy would not work on its own. Dominic started chemo and had two cycles before the surgeon operated again. This time it was successful and he managed to remove Dom’s tumour. The next three years of our lives became daily chemotherapy, hospital visits and constant worry. We were going back and forth to hospital for over two years. He would go to hospital every four weeks for chemo. In between cycles of chemo he would come home. A nurse would come to check his bloods and look after his Hickman line (he had a double lumen Hickman line). His Hickman line had to be changed three times because it didn’t stay in place. This involved a small operation and he had to stay in hospital for it. 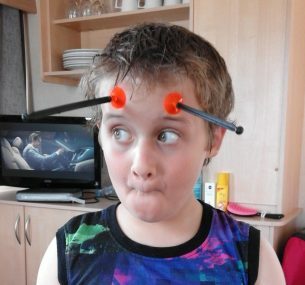 Dom also spent time in our local hospital when he was unwell and for blood and platelet top-ups. His treatment finished in February 2012, two years after his first surgery. 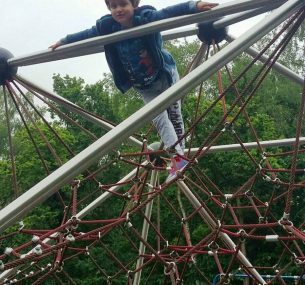 From then on Dominic had six-monthly MRI scans, until August 2016. Dominic is now seven years old. He is in mainstream school and has been off treatment for nearly five years. He has some hearing loss and wears hearing aids. He has some sight problems on his right side. He suffers emotionally at times, but is doing so much better than anyone thought he would. It has been very tough, but having my family and Dom’s sister to look after has helped me get through. We also had some great nurses and doctors that I will never forget. He is a very loving little boy. He is a real fighter. He is getting some new hearing aids which are better for him. He is so excited about them. 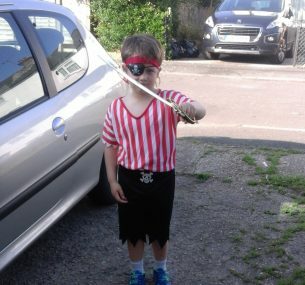 He has been thriving in Year 3 at school, so his health plan has been helping him a lot. His reading has just taken off now. He loves Googling facts on his tablet and then tells me about what he has learnt. His got a big thing about animals at moment and has asked for a dog which we are looking into. He says he going to work with animals when he gets older. He is also a big joker and loves tricking people. Dom also has a very big heart and loves helping me. He is still very close to his older sister. There are lots of ways that you can help children like Dominic in their fight against cancer.